Engineers at the Raja Ramanna Centre for Advanced Technology in India recently partnered with Fermilab to test the product of their unique laser welding process, which could eventually reduce the cost and time required to weld niobium accelerator cavities. SRF cavities, which make up the core of modern accelerators, are typically made with niobium, an exotic metal with a high melting point and other sensitivities that prevent engineers from welding it using conventional methods. Most laboratories fabricate niobium cavities using electron beam welding machines, which must operate in a vacuum. "The maintenance and operation for electron beam welding machines are expensive," said Fermilab engineer Chuck Grimm, who is a main point of contact for the RRCAT team. "But they produce very good, very consistent results." 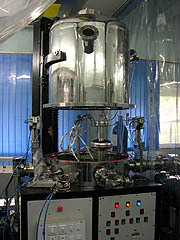 A group led by engineer Prashant Khare, head of the cryomodule engineering laboratory at RRCAT, an Indian Department of Atomic Energy laboratory, successfully fabricated a 1.3-gigahertz, single-cell cavity using a laser and no vacuum, only a stream of ultra-pure argon gas to keep the molten niobium from becoming oxidized. 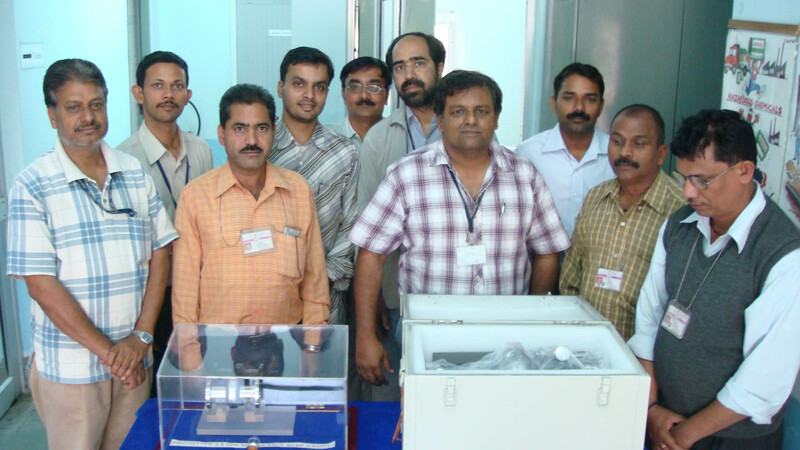 RRCAT laser physicist Brahmand Upadhyay led a team that developed the laser, and an Indian industrial partner developed a special welding rig for the project. Producing laser-welded SRF cavities could reduce the cost of cavity fabrication for future accelerator projects, such as a free-electron laser or a new proton accelerator, Grimm said. The fact that Fermilab has worked with RRCAT on accelerator R&D projects for the past six years and the availability of the necessary expertise and infrastructure made Fermilab the obvious location to test the cavity. "Fermilab has been very supportive of all projects related to SRF," Khare said. "Even if an idea is new and unconventional, they accept it. They say, 'Let's give it a try.'" The Indian Institutions – Fermilab Collaboration (IIFC) is developing a similar testing infrastructure, which is scheduled to be operational in the near future, at RRCAT. The cavity, along with RRCAT engineer Rupul Ghosh, arrived at Fermilab in July. Khare followed in August. He witnessed a preliminary test, in which engineers ramped up a current in the cavity to see how much it could handle. "The accelerator gradient was going up," he said. "Our heart rates were also going up. I could see the happiness on everyone's faces." The single-cell cavity achieved a highly commendable score, with an accelerating gradient of 17 megavolts per meter and a quality factor of 1.4x1010. "It takes a while to refine everything, to get the parameters set up and to have reproducibility," Grimm said. "So I am very impressed with the way their first cavity turned out." After the first test, Ghosh, Fermilab engineer Allan Rowe and Rowe's team put the cavity through polishing and baking processes to remove impurities. Scientists and engineers on both sides of the Pacific were thrilled by the second set of results: an accelerating gradient of 31 megavolts per meter and a quality factor of 1x1010. A nine-cell cavity receiving such a score would qualify to be used in proposed future accelerators, including a high-intensity proton accelerator at Fermilab. Fans of "Doctor Who" will be very familiar with the stupefied phrase uttered by all new visitors to his Tardis: "It's ... bigger ... on the inside." As it turns out, this apparently irrational idea may have something to contribute to our understanding of the universe. A team of cosmologists in Finland and Poland propose that the observed acceleration of the expansion of the universe, usually explained by dark energy or modified laws of gravity, may actually be the result of regions of spacetime that are larger on the inside than they appear from the outside. The researchers have dubbed these "Tardis regions." Perhaps the most surprising cosmological observation of the past few decades was the 1998 discovery by Perlmutter, Schmidt and Riess, that the expansion of the universe has been accelerating for the past five billion years. This result, which won the 2011 Nobel Prize, was quickly corroborated by observation of independent phenomena such as the cosmic background radiation. Regardless of which listing of environmental liabilities you look at, waste in its various forms is always near the top. Part of the reason for this is that waste contributes to many other issues. Many chemicals contain volatile components that contribute to ozone depletion or climate change if they are not managed correctly. 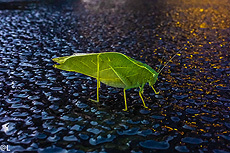 Poorly managed excess chemicals can escape and create water and air pollution, eventually leading to a decrease in habitat quality and ecosystem degradation. Reducing or eliminating waste has always been a hallmark of sustainability efforts. In DOE, the phrase "waste minimization and pollution prevention" has attained meme status and is often shortened to "waste min," "P2" or WMPP. Federal statutes such as the Resource Conservation and Recovery Act and the Pollution Prevention Act emphasize minimizing waste and preventing pollution whenever possible. Although it sounds like these are two different things, they are so similar that it is useful to think of them as one concept. The key is source reduction. If we can reduce the amounts of materials we use or keep on hand, we're likely to reduce the amount of material that is wasted. One way to do that is to plan purchases carefully so as not to build up wasteful inventories of excess — unneeded stuff. Although the unit cost of things often goes down as the total amount purchased goes up, if you eventually have to pay to dispose of the excess as (potentially hazardous) waste, those minimal savings can easily be wiped out. 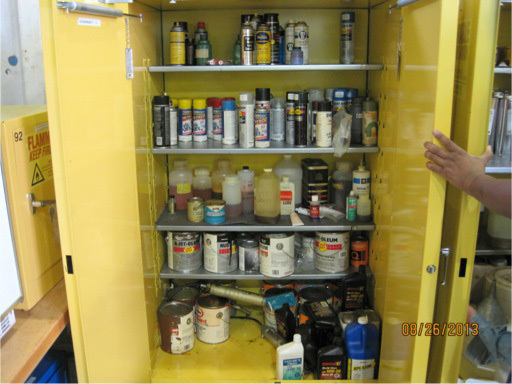 The Hazard Control Technology Team in ESH&Q is urging Fermilab employees to look into their chemical inventories and clean out unnecessary items. Since August of this year, they have safely cleaned out and disposed of 555 individual containers of excess materials totaling 275 gallons. The average size is less than a half-gallon per container, so it isn't limited to large amounts. More cleanups are scheduled in the future. Recently, during one of the cleanups, PPD discovered a 5-gallon can of a chemical that forms potentially explosive shock-sensitive peroxides. 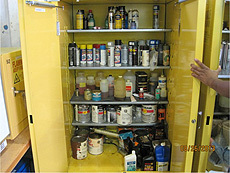 The chemical had been sitting unused in a cabinet since 2005 and appeared not to have been opened. Because of the potentially dangerous nature of the chemical, a hazardous waste company had to be called to render the material safe for disposal at a cost of nearly $4,000. Adopting a program of carefully planning purchases, managing all materials including chemicals and promptly disposing of unnecessary materials and chemicals will help to protect the environment, keep the workplace safe and save money. In 2004, when discussion began around a proposed experiment called the Dark Energy Survey, Marcelle Soares-Santos was a 23-year-old with an undergraduate degree. Today, DES's Dark Energy Camera is starting operations in the Chilean mountains and Soares-Santos, now 32 and a postdoc at Fermilab, is using an algorithm she designed to identify galaxy clusters in DES data. The timeframe for DES is not unusual in particle-physics experiments, which can take upward of 10, 15 or even 20 years to move from conceptualization to actualization. 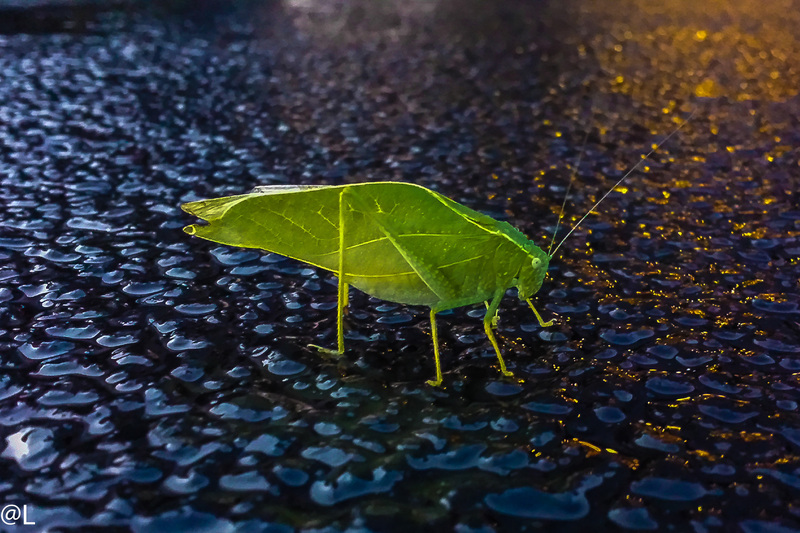 "Those who plan future experiments are not necessarily the future experimenters," says Syracuse University postdoc Jonathan Asaadi. Due to an editing error, Friday's Physics in a Nutshell column incorrectly stated that a Minnesota detector saw an unexpected cluster of neutrinos from a supernova in 1987. In fact, the detector was located in Ohio. The updated version of the article is here. Fermilab Today regrets the error.